Today on Gabbin’ with Gamers, Eric (a.k.a. 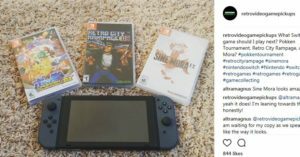 Retro Video Game Pickups) joins The Switch Effect to share in their passion of gaming and collecting. After seeing posts and posts of retro goodness, we just had to chat and learn more. Eric, thank you for speaking with The Switch Effect. Before we get into it, could you tell us a little bit about yourself and how you got involved gaming? Thanks for having me. My name is Eric and I run Retro Video Game Pickups (RVGP). RVGP is a page where I post about my pickups from Goodwill, Thrift Stores, Game Stores, and Craigslist. I also post reviews of games and gaming related products. I have been collecting games for about six years now, but I have been playing them since I was eight years old. I enjoy going out looking for video games, then taking them home, and discovering the new games. The Game Boy Pocket was my first console that was mine. I took that thing everywhere I went; who knows how many hours I have spent playing Super Mario Land on the Game Boy. I think my favorite memory is playing Blades of Steel on the NES. As a hockey fan, this game was the best because I could beat my friends at it every time. I still play this game from time to time and still love it. Let’s jump forward a bit. Were you always a collector or did that come later in life? I always had games, but I didn’t really consider it as collecting until about six years ago when I started going out and searching for games. I think once I got a job that could pay for the collection, that is the point I started actually collecting. Before that, I was just getting games as gifts from my family and friends. Out of your entire collection, what is your most prized possession? My most prized possession has to be my Jungle Green N64 that I got from my grandfather right before he passed away. I have some expensive games like Little Samson or a Boxed Earthbound, which are both great, but the Jungle Green N64 has sentimental attachment. Yes, this is exactly what you think it is! On the flipside, what is the one game/game item that you want to have in your collection? I’ve been on the lookout for Super Mario RPG for the SNES for the last year or so, but every time I find one locally, it is way overpriced. I would also like to get my hands on a Famicom with a Disk Drive; I think that would be cool to own. Here’s one to get you thinking. If you did not play/collect games, what would be your hobby? I have a love for music, so if I didn’t play/collect games I would spend more time playing music for sure. Absolutely love it! It is the best console of this generation by far. Whenever the rumors of what the NX was going to be, that is when I was hooked by it. I bought the Switch day one with Zelda and Super Bomberman R. The Switch is great for not only portability, but also gameplay. The Xbox One and PS4 have focused too much on competing with each other for best looking, while Nintendo has been innovative with the Switch. If you don’t own a Switch once you finish this interview, GO BUY ONE! With so many games being released during these past months like Mario Odyssey, Doom, LA Noire, Rime, and Skyrim, it is hard to narrow one down. I do plan on buying all for the Switch, but I think Skyrim is the best thing that is coming out for the Switch that I am looking forward to since I just finished Mario Odyssey. Instagram was really interesting to me because you could take a beautiful picture and be able to display what you are wanting to portray in that picture. I started my Instagram to form a community around gaming/retro gaming. I love being able to see what games/consoles that my friends have picked up even when they got it at a steal. That is a nice collection of Switch games! Instagram usually gets to see everything first, but whenever I review something, Facebook gets the longer version of my reviews. Go check those out in order to see my latest pickups and reviews. Last question now that we’ve run you through the gauntlet. Is there anything else you’d like to share? I would just like to thank The Switch Effect for having me. It has been fun answering these questions! If anyone gets a Switch, contact me and let me know what you think about it. Thank you again for taking the time to speak with The Switch Effect and share your gaming and collecting background. We look forward to what you pick up next!